If you've ever had trouble keeping Thigh High Compression Stockings in place during wear, this pair may have been made just for you. Truform makes these Women's Thigh High Compression Stockings with a special silicone top band at the top of the stockings. The top band is dotted with silicone on the inside that ensures they stay in place without pinching or rolling, even during active wear. In addition to having silicone dots, the top bands of these Truform TruSheer Stockings also flaunt an attractive lace design that fashion-savvy women love. This lace design, combined with the stockings' sheer fabric, gives them the appearance of designer, non-medical hosiery perfect for maintaining a discreet look. 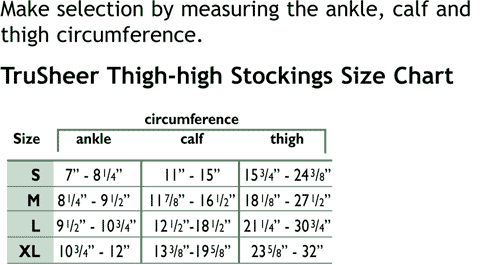 While looking great in these TruSheer Support Socks, you'll also be receiving effective Compression Therapy in the 20-30 mmHg compression range. 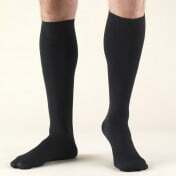 This firm compression range is recommended to treat moderate to severe swelling of the legs and feet, varicose veins and other symptoms of chronic venous disorders. Choose between beige, black, and taupe color options. Experience the soothing relief relief waiting for you with compression therapy.